The Sadness of Leaving Comic Con! We have moments in our life where we experience sensory overload. We find a place in our hearts to let all of these emotions, and senses, flow to create happiness, anger, sadness, anxiety, fear, etc. This is exactly what happened to me during SLC Comic Con this last weekend. As a nerd, the sensory overload becomes very real when you go to a place like Comic Con. It’s a place where those who tend to feel ostracized are able to go and let their true colors shine. A lot of people do luck out, like I do working for The Group Real Estate, that there is support for my nerdom. 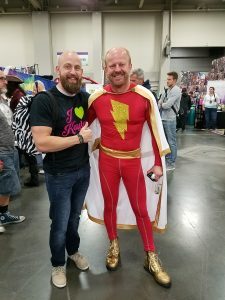 Most people who go through life, wanting to wield a fantasy sword or dress up like Captain America, would generally be made fun of outside the Comic Con environment. When you enter the Comic Con environment, if you are one of these people, you will undoubtedly feel right at home. 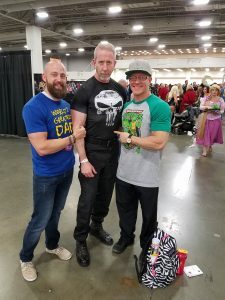 Some who get made fun of outside the environment, come to the Convention and right away, there are so many there who want pictures with them, who are wielding the same sword, and spewing Captain America’s name. Nerd culture is a phenomenon these days. You will see so many different types of people at a Comic Book convention. People bringing their kids to share in the nerdom. People there showing off their talents in dressing up, in fighting with a light saber, and just being in a place that showcases a general love and appreciation for one another. As a fellow nerd, I was very much in my element. And the reason for the title of this blog, is when those moments pass, a sudden rush of nostalgic type sadness sets in. As a nerd, there are a lot of passions for certain things in my life. Comic books that take me back to when I first started collecting. Actors or actresses who star in my favorite shows. But not just any shows, these are shows that hold a very special place in my heart. One of those shows is a short lived TV phenomenon called ‘Firefly.’ One of the actresses from the show was there and I knew that needed to be my number one priority. 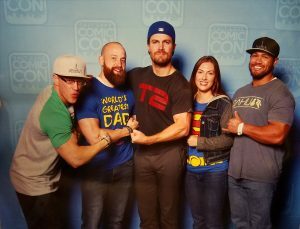 The Photo Op with her went so well, as she proclaimed an excitement for the tee shirts I had made on her behalf. Even so, the Photo Op happened too fast to fully appreciate the gumption of the moment. In the blink of an eye, it was over. The next day as we looked down the lines of so many other actors, writers, artists, etc. 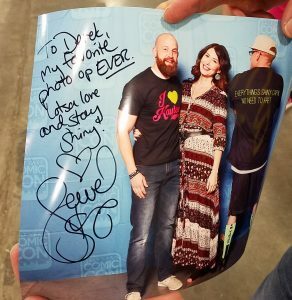 we made the idea that I should go try and see her again and have her sign the photo we had taken. With so much going on, we made it a point to go try and see her again. When the moment happened, due to some strategy from the guy I was with, we got in line to meet her at the very last second. We were second from the end, before she needed to leave for a panel, then leave the Con for good. As we approached her, she remembered who we were from the previous day, and signed my photo. As I told her, and one of the business workers with her, that ‘Firefly’ holds a very special place in my heart, she simply said, “Thank you” but as I then proceeded to talk about the special reason, that it’s a show I binge while I’m sick, because it helps me feel better, she became emotional, which in turn made me emotional. 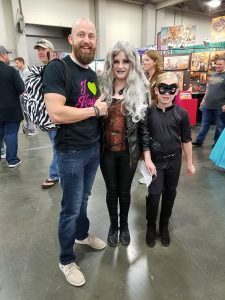 At this moment, she shook my hand, looked me in the eyes, and said, “This is the reason I love to come to these Comic Book conventions.” This was sensory overload for me. Tears came and went, seeing her came and went, laughing with her came and went, and seeing the humility in her came and went. It’s these types of moments that help us live. And live on. 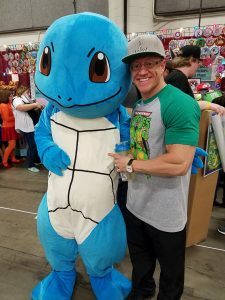 In a world filled with so much hate, not a lot of unification, and sadness, these Comic Book Conventions bring forward so many happy moments, memories that can be cherished forever, and it helps you forget that so much bad is happening in our world. As we experience these sensory overload moments, they are hard to recover from. The highest of emotional highs happens and emotions we love to feel, but for some reason suppress in our day-to-day, are exploding. So after the fact of it all, it’s as if we’ve shut off. As a long time comic book fan, I wanted to make sure to meet the artists I have loved for so long, one of whom I met 9 years ago at San Diego Comic Con, and another who drew one of my all time favorite comic book covers. This adds to the special feeling we all get when we attend these Conventions. Talking with an artist that I have followed for years, have loved his art, and want to experience more of it. Even though a sketch from his was expensive (artists need to make a living too), with him knowing my true fandom for him, he decided to do a quick sketch for me, free of charge. These moments will last forever. The memories that are made are what we truly need to be thankful for in these moments. Was it great to get the sketch? Was it great to meet this actress that I love so much and hold in high regard? Yes. Was it amazing to experience the love and ambiance of so many nerds in one locale? Yes! A million times yes to all of these things. But the greatest part of this adventure, is that the memories will last forever. The handshakes, the hugs, the tears, the laughter, the beautiful sights and the all around camaraderie of Con.. will forever be locked in my heart.